Last week I mentioned how Walt originally wanted to be a cartoonist, in 1917 when he was back in Chicago doing cartoons for the McKinley High School magazine THE VOICE, he attended night classes at the Chicago Institute of Art. 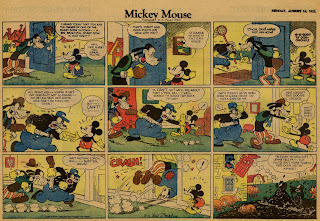 Walt learned cartooning techniques from cartoonists Carey Orr and Leroy Gossitt. 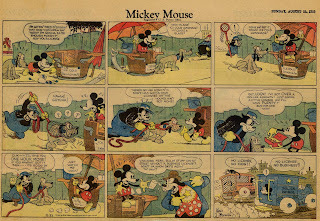 When looking at Walt's early work it is evident that he must have been quite influenced by Orr, when comparing Walt's cartoons for THE VOICE (See pg 3 of illustrations in Bob Thomas' WALT DISNEY: AN AMERICAN ORIGINAL) with the above comic strip by Orr, you can see Walt groping towards that style of drawing. Walt even adds a note "appologies to Orr" at the bottom of the page. Contrary to what some have said Walt clearly had the ability to draw, and had he continued we may now be discussing Walt for a whole different set of achievements. What I find quite reassuring is that Walt started out like all other artists, trying to find his voice and eventually did, moving beyond his humble beginnings. CAREY ORR (1890 - 1967) was an editorial cartoonist for the Chicago Tribune, and creator of the comic strip Kernel Cootie. He won a Pulitzer for his editorial cartoons in 1961, and was also the uncle of Apple Mary creator Martha Orr. The above artwork being offered by the LEWIS WAYNE GALLERY on e-bay, was drawn in 1921 at which point Walt was already at Film Ad and starting up Laugh-O-Grams. It's interesting to consider for a moment that Walt's original dream was to become a newspaper cartoonist, after being rejected he discovered animation and the rest is history. Although he really didn't get too involved with the comic strip department, he accomplished that youthful dream in a kind of round about way.